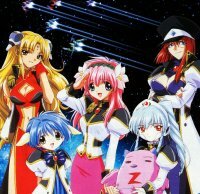 Plot Summary: The Angel Brigade, an elite branch of the Transbaal Empire military, are assigned to search for The Lost Technology, mysterious items from the past that hold unknown powers. Led by the soon-to-retire Colonel Volcott O' Huey, the Angel Brigade travel to different planets using their specially designed Emblem Frame ships to search for Lost Technology. Unfortunately, they often mess up somehow and end up getting into all kinds of awkward and troublesome situations.